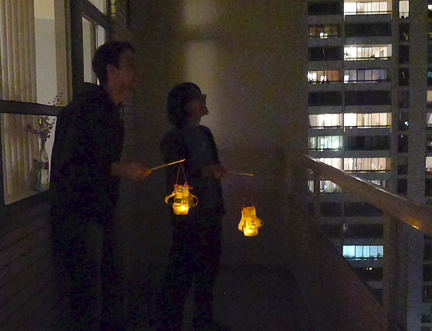 And here I am many moons later, with safe, battery‐operated lanterns (and Mike’s interpretive moon‐gazing — sadly, our balcony doesn’t face the moon). Kind of like Halloween here in some ways. 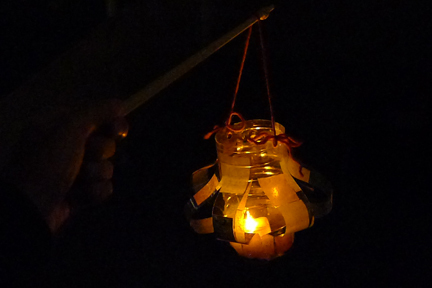 Instead of going around the neighbourhood dressed in costumes kids would bring their lanterns and play on the street with their friends. 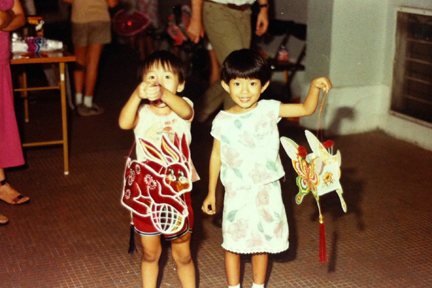 An important part of the tradition is moon‐gazing, but I only remember everyone sitting around folding tables on the rooftop eating pomelos and mooncakes. Not a lot of gazing but everyone had fun chatting anyway. 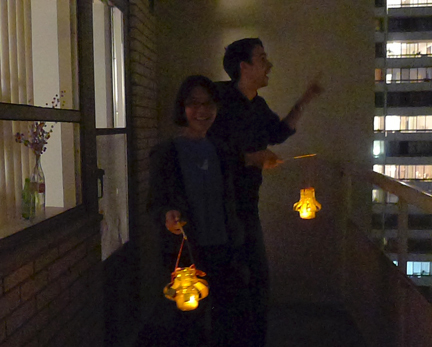 And then suddenly the kids feel too old for lanterns. But they still get together for dinner with families. 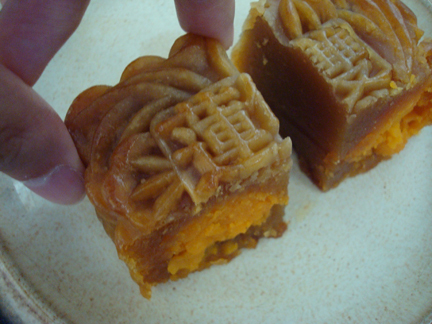 Until one really is getting old, then one gets all nostalgic and starts making lanterns and eating mooncakes around Mid‐Autumn Festival. 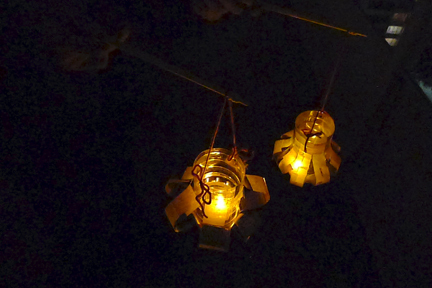 I thought I’d share how I made the lanterns so you can celebrate Mid‐Autumn Festival at home too, If you like :D Or it might come in handy if one needs a decorative lantern for other occasions. First, peel off the backing of one sheet of the contact paper and place it on the table sticky side up. Arrange bits of tissue paper on it until the contact paper is mostly covered. Then peel off the backing of the other sheet of contact paper and place it directly on the contact paper with tissue paper on it, matching all sides (to the best of one’s ability — it can be tricky to match all sides perfectly. It can always be trimmed later). 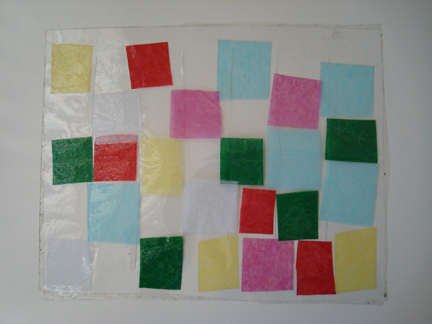 Basically, the bits of tissue paper are sandwiched between 2 sheets of contact paper. 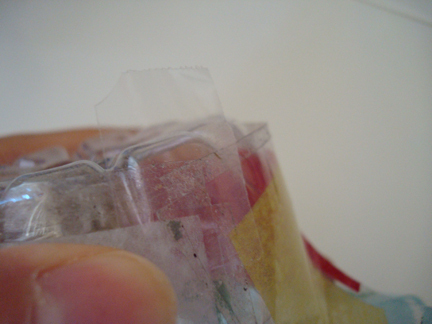 Folding the contact paper sandwich in half lengthwise, make even cuts across, leaving about an inch of space at the top. Once all the cuts are made it looks like this, with uncut one inch spaces at both the top and the bottom of the sheet. Now cut off the top, dome part of the plastic bottle. 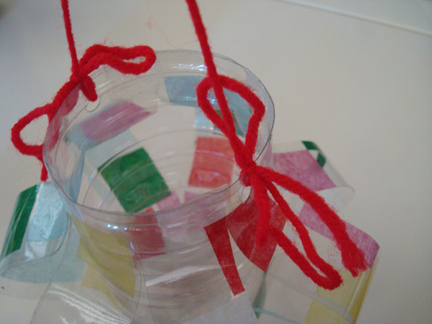 Wrap the long side of the contact paper around the top of the plastic bottle. 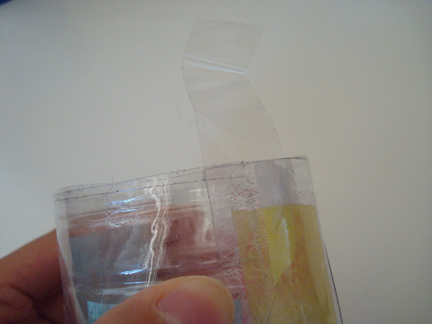 Tear a length of clear tape, place half over where the two ends of the contact paper meet, and fold the other half over the rim so it sticks to the inside of the bottle. 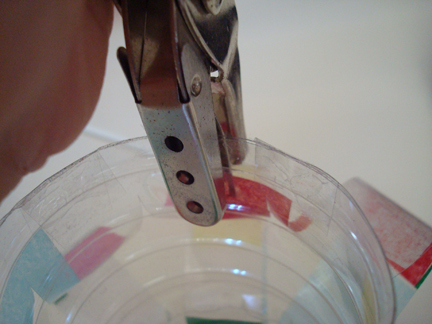 Place more tape around the rim of the bottle in the same manner to secure it. Then, turn the bottle upside down so the bottom is facing up. Bring the edge of the contact paper down so it lines up with the bottom of the bottle. 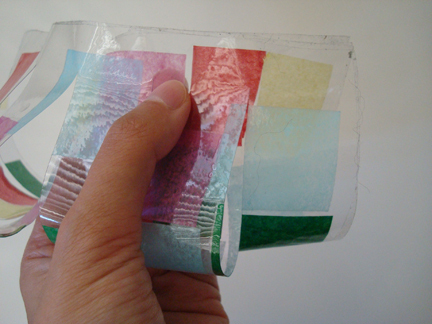 Tear a length of clear tape, place half over where the two ends of the contact paper meet, and fold the over half over so it sticks to the bottom of the bottle. 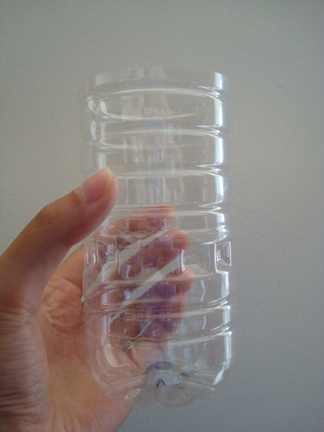 Place more tape around the bottom of the bottle in the same manner to secure it. Punch one hole close to the rim of the bottle, and another hole directly opposite from the first hole. 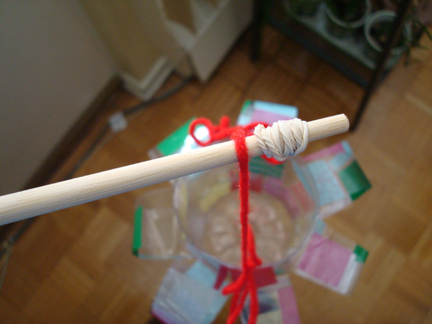 Tie a length of yarn to the holes. 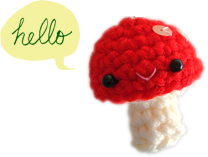 I made bows so they look a bit like tassels. 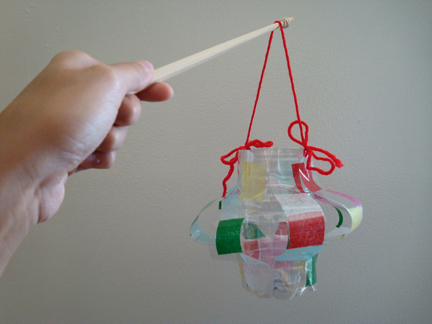 Wrap the elastic band around the end of the chopstick, so when the lantern is hanging on it it won’t slip off. 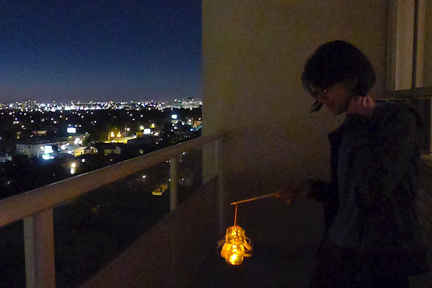 And so today as I enjoy mooncake and walk around with my lantern I’m grateful for family. I’m so very grateful for the man who always supports me enthusiastically, from deciding to go back to school for the nth time to standing around on the balcony with a lit‐up plastic water bottle. And I’m thinking of my family whom I don’t see everyday. We may not be able to celebrate together but I pray that they would be safe, and their hearts content with joy as they gaze at the same full moon across the distance. And I wish you good health and happiness for the fall season!